FujiFilm today extends its Z-series compact cameras with a new premium addition, the FinePix Z900 EXR model. The digital shooter packs 16-MegaPixel EXR CMOS sensor,along with FUJINON 5x wide angle refractive optical zoom lens (28-140mm equivalent) and 3.5-inch touch screen LCD with an easy-to-use multi touch user interface. The FinePix Z900 EXR features fashion-forward design with slim metal chassis and high gloss finish, offers full 1080p HD movie capture in the H.264 format, also a new EXR Auto mode that recognizes 27 scenes, an intuitive Dual Direction GUI with vector font that allows for smooth and easy navigation with an improved Flash animation user interface with “tap and shoot” capabilities and image tagging with automatic upload functions to YouTube and Facebook. Z900EXR is capable of burst shooting at 12fps and high speed movies at 320fps at full resolution. It incorporates Intelligent Image Stabilization, Face Recognition/Detection and Automatic Red-eye Removal along with i-Flash Intelligent Flash, also offers Motion Panorama 360, up to ISO 6400, 1600% wide dynamic range and Mini HDMI port. 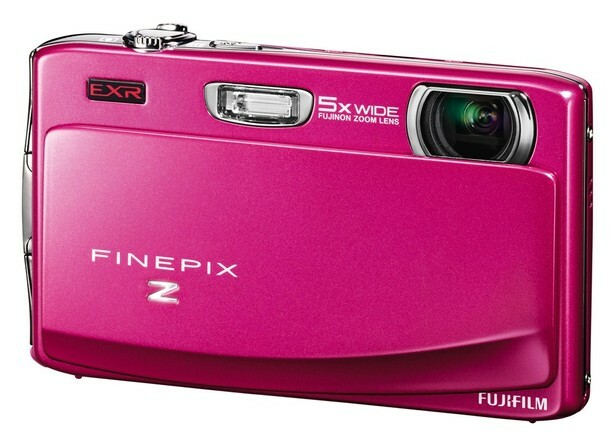 The FinePix Z900 EXR will be available in Brilliant Black, Gloss Red, Hot Pink and Royal Blue, starting May 2011 at a retail price of $279.95.